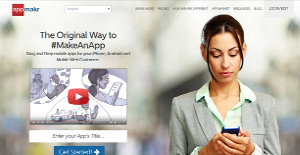 AppMakr is a very popular online platform to create apps. It’s one of the most used platforms and over 2 million apps have been created on the platform so far. The platform allows the users to create apps through easy steps; a user doesn’t need to have coding skills in order to make an app. The apps made using this platform are compatible with Android, iOS, and Windows platforms. AppMakr offers free and paid accounts to its users. Users can create basic apps with a free account whereas to add advanced features and customizations, users have to buy paid packages. The platform also allows the users to test the app for its quality and functionality after its publication. One of the reasons for the huge popularity of AppMakr is that creating an app on this platform is a walk in the park. You don’t need any coding skills to create an app on this platform. All you have to do is complete some drag and drop procedures and rest will be taken care of by the platform. Moreover, the platform will walk you through every step of the app creation with the help of easy guidelines. Another prominent feature is the WYSIWYG simulator that shows real-time results while you accomplish every step. The simulator appears on the right side of the screen and a user can visualize every step of the development with the help of this simulator. The process of app creation involves adding text, audio, video, and HTML elements. One this process is complete, the platform facilitates you to publish your app on the online stores. You can also do the quality assurance of the app with the help of powerful app testing tools available on the platform. You can also make changes to the app and update it through the platform once it is published. The premium packages of this platform allow the users to monetize their apps and disable the ads too. Moreover, the multi-language support allows the users to cater to the international market. Every enterprise is different, and can need a special Application Development Software solution that will be designed for their company size, type of clients and employees and even particular niche they deal with. We advise you don't count on locating an ideal app that is going to be suitable for each business no matter what their history is. It may be a good idea to read a few AppMakr reviews first and even then you should keep in mind what the service is intended to do for your company and your workers. Do you need an easy and intuitive solution with just elementary functions? Will you really make use of the advanced tools needed by pros and large enterprises? Are there any specific tools that are especially practical for the industry you operate in? If you ask yourself these questions it is going to be much easier to locate a solid app that will fit your budget. How Much Does AppMakr Cost? We realize that when you make a decision to buy Application Development Software it’s important not only to see how experts evaluate it in their reviews, but also to find out if the real people and companies that buy it are actually satisfied with the product. That’s why we’ve created our behavior-based Customer Satisfaction Algorithm™ that gathers customer reviews, comments and AppMakr reviews across a wide range of social media sites. The data is then presented in an easy to digest form showing how many people had positive and negative experience with AppMakr. With that information at hand you should be equipped to make an informed buying decision that you won’t regret. What are AppMakr pricing details? What integrations are available for AppMakr? If you need more information about AppMakr or you simply have a question let us know what you need and we’ll forward your request directly to the vendor.